The other week when I was shopping the dollar bins at Target I ran across a fun jadeite green dustpan that had a decidedly vintage feel about it. Now I didn’t really need a new dustpan, because I rarely sweep my floors with a broom. I’m not a bad housekeeper, I just usually use a little electric vacuum instead. And I have a perfectly good 25 year old plastic dustpan that the dog chewed the corner off of for when I DO decide to go old school with my floor sweeping. 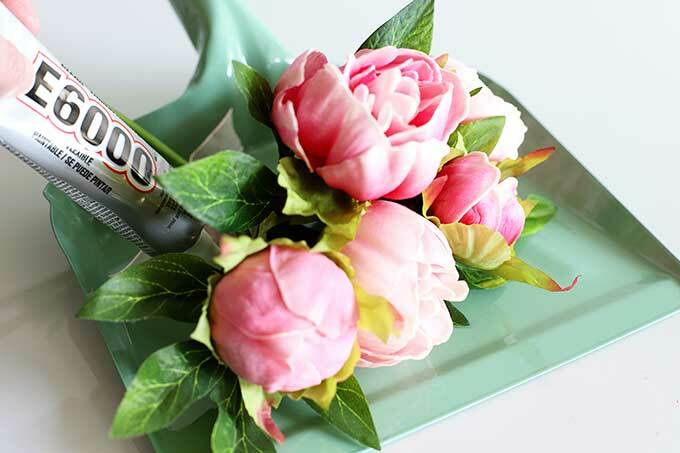 But I knew I had an upcoming post with Grove Collaborative about a fresh new spring freebie offer they were having, so a dustpan seemed like the perfect thing to use in my spring cleaning photo shoot (I’m sounding all photographer-ish aren’t I). But just in case that didn’t pan out (or should that be dustpan out? ), I stopped at Michaels on the way home from Target and bought a bouquet of faux peonies and a little Easter bunny pick too. 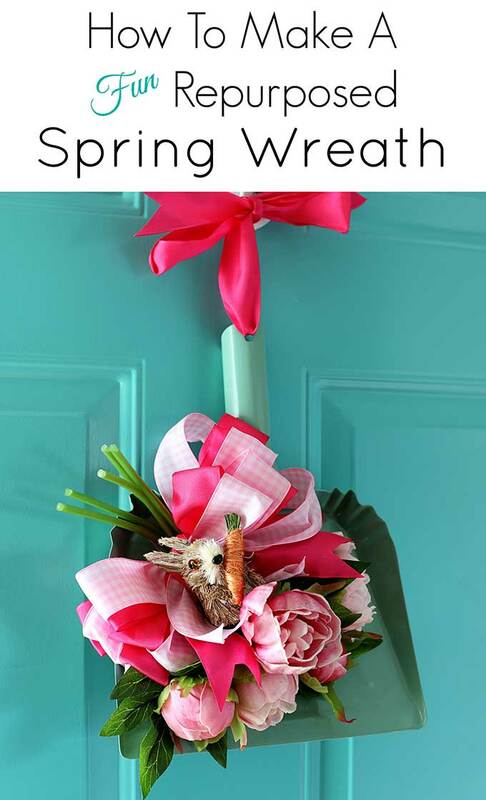 You know, to make a fun and funky spring door wreath with it! 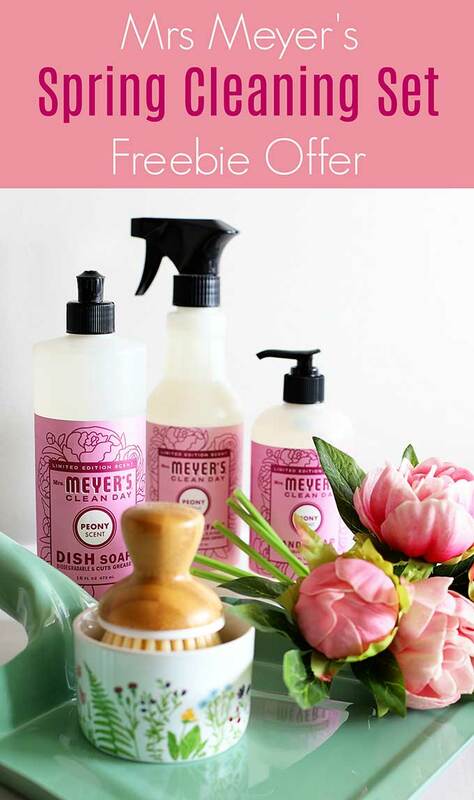 Be sure to check out the FREE Mrs Meyer’s cleaning set offer at the end of my tutorial. 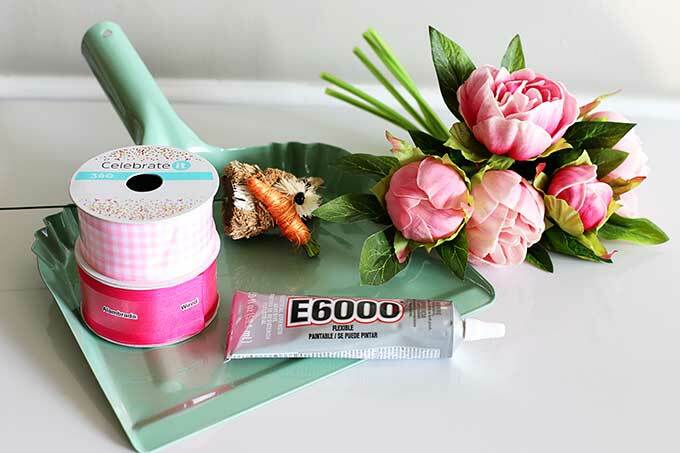 Glue your flowers to the dustpan. I found the bouquet of peonies at Michaels already put together and tied with a small ribbon. I think they are meant to be part of a wedding bouquet??? I placed mine off-center just a bit. And then put a soup can on it while the glue set up. Tomato soup, if you are interested. Next I made a bow out of all that ribbon. I would show you how I made a bow . . . but it’s a bow. I will mention I used a fancy bow maker. I will not mention that manufacturer of the bow maker, but it was one of those made for tv products and it was a TOTAL FLOP. I ended up rescuing my ribbon from the fancy bow tying “machine” and just doing it by hand. Then I glued the bunny on top of the bow. Super cute (if I’m allowed to say that myself). BTW, you can see how I painted my front door HERE. Be prepared for some pretty darn ugly photos of the process. Now on to the spring cleaning freebies. And if you are already a Grove customer click HERE to get a free 2-pack of the Grove walnut scrubber sponges. Look at that gorgeous dish brush set they are throwing in this time!!! And you’ll notice it’s setting in my dustpan aka door wreath! Sign up for Grove Collaborative HERE. The freebie offer will immediately be added to your cart. 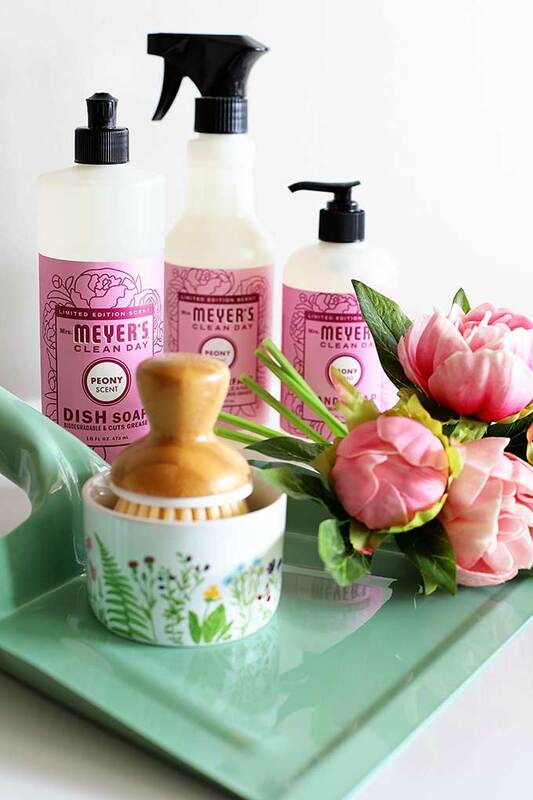 Feel free to pick your own scents for your full sized hand soap, dish soap and multi-purpose cleaner (there’s a little drop down box with an arrow that allows you to choose the scent – PEONY, MINT or LILAC). You’ll be asked a few quick questions about your cleaning routine and some additional suggested items will be added to your cart. Feel free to add or delete anything from your shopping cart (just don’t delete your freebies). Change the scents? Change the items? Scrap their suggestions and start from scratch? Go for it – it’s your shopping cart. With your 1st $20 purchase through Grove you will receive your free cleaning set. 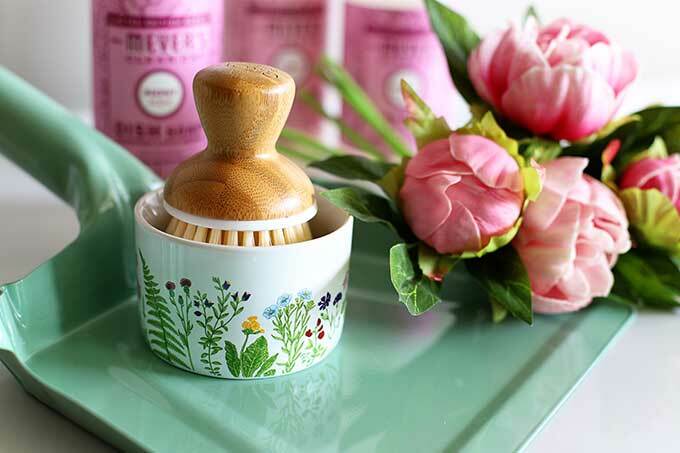 I’ve been using Grove for probably 2 years now and it is a great way to get my beloved Mrs. Meyer’s products at a good price (great price) and have them shipped to me from the comfort of my couch (getting dressed is so overrated). This is a subscription service, so every month they will email you and/or text you 7 days before your monthly shipment is scheduled to be sent out and again 1 day before your monthly shipment is scheduled to be sent out telling you a shipment is coming up. If you don’t want those items this month, take them out of your cart. If you don’t like that scent, change the scent. If you don’t want a shipment that month, delay your shipment until the next month or cancel your shipment altogether for that month. And you can go to this page and Pause Auto Shipments if you prefer to not have automatic shipments sent to you. Repeat, you do not have to use the auto-shipping feature if you don’t want to!!! *Currently they only ship to the contiguous United States, meaning they do not ship to Canada, Alaska, Hawaii. But let’s face it, if you live in Hawaii, you have beautiful scents all year round! Oh, and they sell far more than just Mrs. Meyer’s products. They also sell Seventh Generation, Method, Caldrea, Tom’s Of Maine, etc., so if heavenly smelling garden-scented goodness is not your thing (are you crazy? ), there are other choices. Heck they even sell TP and paper towels. How convenient is that! That’s it! Easy peasy dustpan easy! Or something like that! Now get out of here and find your dustpan. You’ve got some crafting to do! That is an adorable door decoration, Pam! 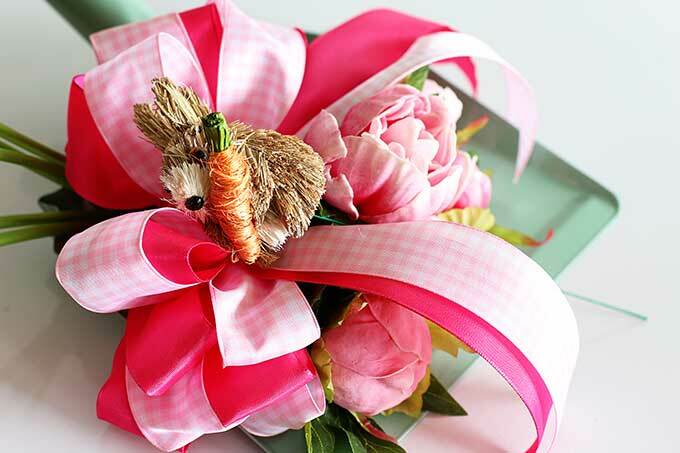 It reminded me of when I was in floral design school…several women cried during the bow making lessons, they were so frustrated. 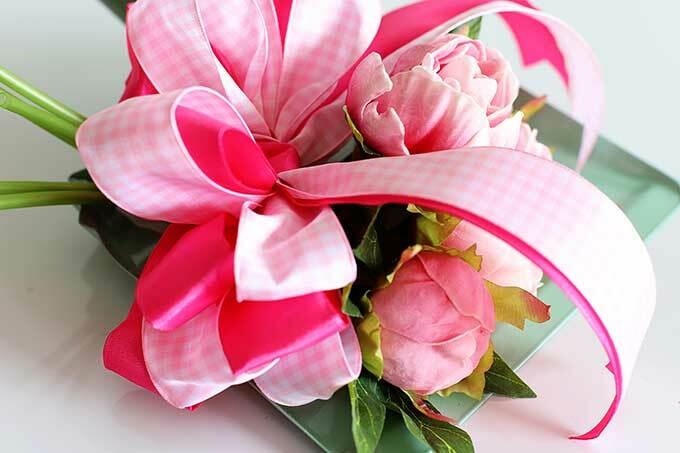 Your bow turned out beautifully! Fun project! Adorable!!! I must get to Target. So pretty! I actually just bought the same dustpan and I’ve been trying to think of what to do with it! Thanks for the inspiration! I keep hearing about these products, I really need to give them a try! 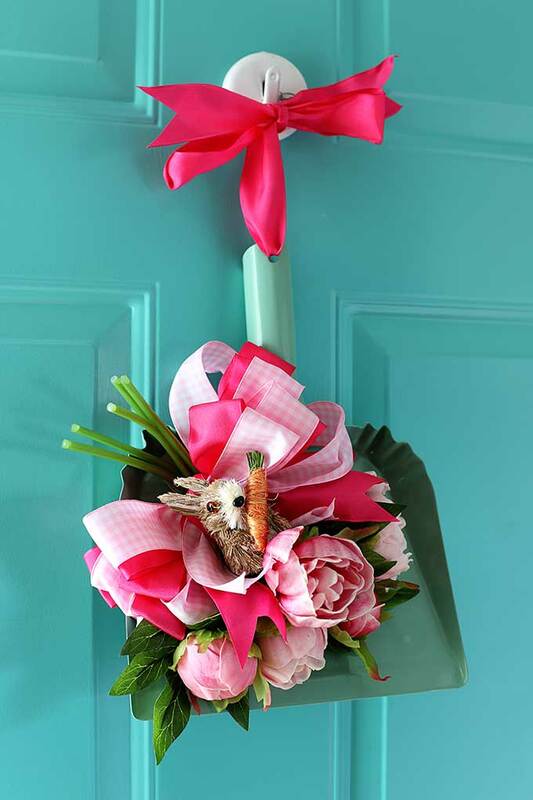 Pam, I like the dustpan “wreath” idea…super cute. 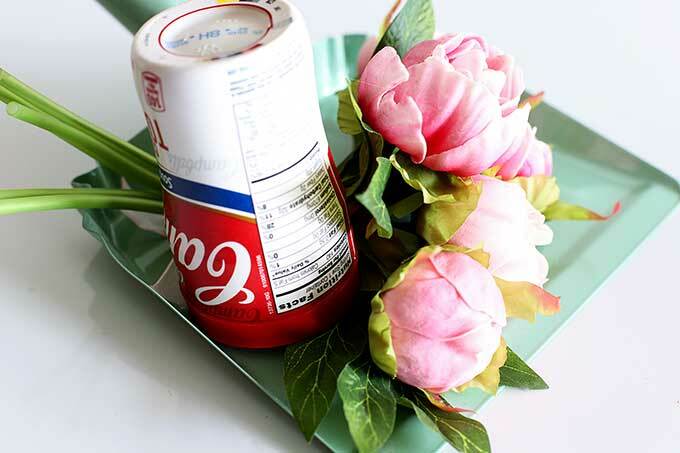 Maybe you oughta rough up that pretty dustpan a little to help it look more vintage, LOL. BTW, do you have to reconstitute any of the Grove products? Or do they come pre-mixed & ready?